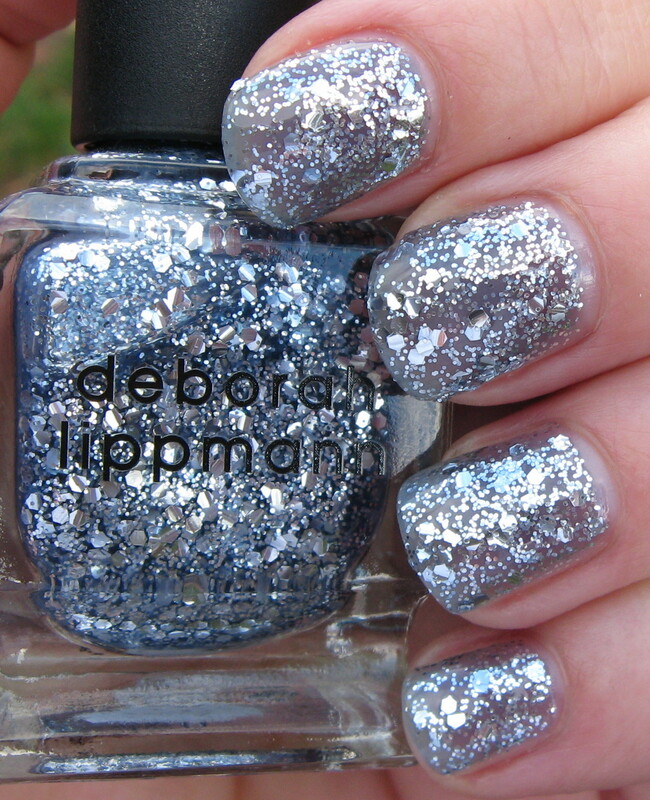 Today Was A Fairytale is one of the Holiday 2010 polishes from the Deborah Lippmann collection. This grey/silver/blue shade is filled with large silver hexagon shaped glitter sequins and tiny silver glitter pieces. The grey/blue base is relatively sheer and reminds me of the Maybelline Water polishes with its subtle tint of color. I'll call this a two-and-a-half coater, because after the first coat I touched up the balder areas, then I applied a full second coat. I still didn't end up with complete coverage, but I don't think it's meant to have opaque coverage. Above & Below: The large silver hex glitter really pumps up the bling, which is perfect for the Holiday season or a night out on the town. I had nothing but clouds when I photographed this, and it's still eye-catching. I was surprised by how smooth the finish was, given the amount of glitter. Below: I like the way this shade looks when worn alone, and I imagine it would also work well over a darker shade. I wanted to try a subtle polish over It's A Fairy Tale, so I chose Orly Winter Wonderland. The finished look is more silver, and this delicate milky white glitter seemed to fuse all of the glitters together for an interesting effect. Today Was A Fairytale is described as a silvery blue starlight glitter with virgin diamond powder. I'm not entirely sure what virgin diamond powder is exactly, but it sounds impressive! According to Deborah Lippmann, "This was created with songstress clients like Cher and Mariah Carey, divas known for their dramatic hand gestures, in mind. I created Today Was A Fairytale to provide show-stopping sparkle that fans would see from the audience. Today Was A Fairytale is exclusively for those nights when you're going to bring down the house." This polish retails for $20.00 and is available at Barneys New York, Neiman Marcus, Nordstrom, and online at DeborahLippmann.com. I love this polish! It's perfect for the holidays! Beautiful glittery look. Unless this goes on sale for half price I'll have to skip it. waowwwwwww i am very impressed by effect !!! Each time I see a DL polish glitter, the effect is amazing !!!! It's really pretty, but not my favorite Lippmann glitter.